For people who have had one osteoporotic fracture, around half will have a secondary fracture in their lifetime. While local specialist services are available to help prevent secondary fracture, in the Richmond area, only 10% of those at risk are being assessed. This project will improve identification and referral for at-risk patients and help improve patient awareness of the risk of secondary fracture. By June 2019 the number of eligible patients accessing the Richmond Osteoporosis Refracture Prevention Program will increase from 10% to 50%. Osteoporosis is a weakening of bones common in women aged over the age of 50. Breaking a bone after a simple fall is often a sign that a person has osteoporosis but around 80% of people who should be tested for osteoporosis when they break a bone are missed. This is a missed opportunity for patient care as there are drugs, and activities such as diet and exercise, that can help strengthen bones and prevent them from refracturing. 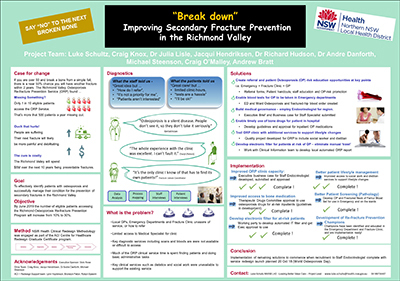 The osteoporosis refracture prevention service in the Richmond region of the Northern NSW Local Health District was established in 2015. Despite the quality of care provided, the service has struggled to get patients through the door and only 10% of patients who attend the service complete their program of care. A number of health service, and patient barriers were identified as contributing to the problem, including poor patient and health provider awareness of the risk. Train emergency department doctors and nurses in the identification of at risk patients, and osteoporosis refracture prevention. Train hospital based orthopaedic doctors and staff working in fracture management services (fracture clinic) to identify at risk patients and refer them to osteoporosis refracture prevention service. Provide osteoporosis blood sets for doctors working in emergency to enable timely testing for osteoporosis. Improve availability of medical officer services to the osteoporosis refracture prevention service through improved governance and use of resources such as telehealth. Improve patient referral process to local community health providers to help maintain lifestyle changes for better bone health such as diet, exercise, and smoking cessation. The success of the project will be measured by changes in patient attendance numbers and service recommendations. The data will be available via established databases for the program as recommended under the ACI Model of Care for Osteoporosis Refracture Prevention1. The following measures will be taken each month. Number of patients identified and screened for osteoporosis risk. Number of patients attending the Richmond osteoporosis refracture prevention service. Number of patients commencing an osteoporosis management plan. Number of patients remaining on a management plan after six months. Ensure permission is sought from operational managers before approaching clinical teams. The value of face-to-face engagement with primary health providers (e.g. general practitioners). Agency for Clinical Innovation. Model of Care for Osteoporotic Refracture Prevention. 2nd ed. Chatswood: ACI; 2018.
International Osteoporosis Foundation. Preventing Osteoporosis. Nyon: IOF; 2017. Agency for Clinical Innovation. Leading Better Value Care: Osteoporotic Refracture Prevention. Chatswood: ACI; 2018.